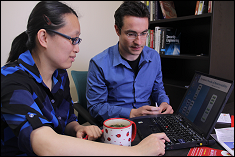 "The exemplary work of Elaine and Babis really speaks to one of the core missions of our cybersecurity center..."
Assistant professors Elaine Shi (left) and Charalampos “Babis” Papamanthou (right), both in the Maryland Cybersecurity Center (MC2), have developed a technology that allows users to store secure data in the cloud, and then retrieve it in a way that provides proof it has not been tampered with. Their innovation, developed in part with the late Emil Stefanov, a doctoral student at the University of California, Berkeley, was just announced as the Invention of the Year in the information science category in an annual competition coordinated by the university’s Office of Technology Commercialization (OTC). The MC2 team was one of 10 finalists out of the 154 invention disclosures received by OTC in the past year, with the winners of three categories—information science, physical science and life science—selected by an independent panel of judges who based their decision on a technology’s impact on science, society and its market potential. "The exemplary work of Elaine and Babis really speaks to one of the core missions of our cybersecurity center - forming interdisciplinary teams to take on real-world challenges and provide real-world solutions," says MC2 Director Jonathan Katz. Shi, who has a tenure track appointment in computer science, and Papamanthou, in electrical and computer engineering, both have appointments in the University of Maryland Institute for Advanced Computer Studies, which MC2 is part of. "Our dynamic proof of reliability scheme will be useful for organizations that want to upgrade to a much higher level of security," says Shi. "Detecting data corruption at storage servers like Dropbox and Google Drive without changing the user experience will significantly boost people’s confidence in cloud computing, and our work lays down important foundations for achieving this goal," he says. Initial seed funding for the project came from Google, and a paper on the team’s early research can be viewed here.